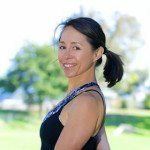 Michelle leads workshops, immersions & retreats worldwide as well as teaching at Santa Monica Power Yoga & Equinox Fitness Clubs. She has studied with many inspiring teachers, among them Bryan Kest, Saul David Raye, Max Strom, Jerome Mercier, Erich Schiffmann and Guru Singh. A steady vinyasas flow focused on moving mindfully with breath. All around smooth full body flow with a theme of observing mind and body in the present moment. Get some cardio with this deep rigorous flow using all your senses!